I know oyster stuffing can seem.... weird. But it's a thing. It's a quite popular thing in certain regions of the US, in fact. I myself could never bring myself to make it or try it ... the thought of biting into an oyster hiding in my dressing kind of icked me out. It's a textural issue for me. But I had the idea to chop the oysters prior to mixing them into the dressing, so you get all the wonderful, briny flavor, but none of the unappetizing slimy texture. Win and win! 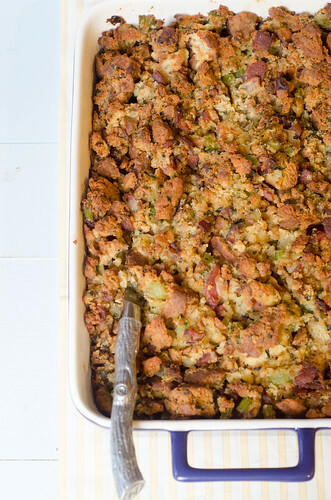 I've previously sung the praises of this southern-style cornbread dressing, and really had zero interest in trying another dressing recipe... ever. But when this biscuit and bacon dressing was recommended to me, I couldn't resist. 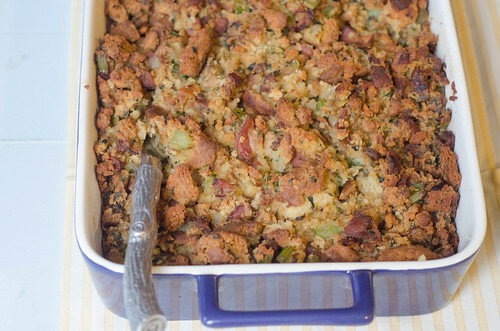 I mean, a stuffing recipe made totally out of biscuits? With bacon? Sold. The oysters were a great addition - the briny flavor was a great counterpart to the salty bacon and rich biscuits. This dressing is absolutely amazing, and I beg you not to be scared off by the addition of the oysters. In fact, when I made this, I made no mention of the oysters, and Joey immediately proclaimed it to be the best stuffing he's ever had. Oysters in your dressing. Do it. Preheat the oven to 350 degrees. Crumble the biscuits into 1-inch pieces, and spread evenly on a baking sheet. Toast 20-25 minutes, or until the biscuits are lightly browned. Remove from oven, set aside to cool, and increase the temperature to 375 degrees. Meanwhile, in a large skillet, cook the bacon until browned and crispy, stirring often. Use a slotted spoon to remove the bacon to a paper towel-lined plate. Pour all but 3 tablespoons of the fat. Add the onions to the skillet and cook until they begin to soften, 5 to 6 minutes. Add the celery, celery leaves, parsley, sage, and thyme, and cook, stirring often, until the vegetables are softened and beginning to brown, another 5 to 7 minutes. Meanwhile, add the oysters to the food processor and pulse a few times to finely mince. Set aside. In a large mixing bowl, gently stir to combine the biscuit pieces, sautéed vegetables, and oysters. Pour the chicken broth over the mixture and mix well. Pour the mixture into a greased 9x13 inch baking dish. Sprinkle the butter pieces over the top and cover the dish with foil. Bake 30 minutes, then remove the foil and bake an additional 20-25 minutes, or until the top is golden-brown and crispy. Allow to cool 10 minutes before serving. *If you don't want to shuck your own oysters, oysters can be purchased already shucked, in pint containers. They are packed in their own liqueur, so just drain the liquid off before chopping. I swear I never heard of oyster dressing until I started blogging...but that's probably because my family made Stovetop every year! It's definitely intriguing...on my bucket list of things to try someday. I was always too afraid to try oyster dressing at Thanksgivings when I was a kid. I should have. It probably would've been better than the Stovetop we always had. I'll have to try it with the oysters next time.